I have been challenged by The Ephiphany to intervene in a matter concerning the “cheating” ways of AWIP. Obviously, AWIP has been convicted. He has now added the map feature to his blog. Now the world can follow the map. It was overheard yesterday at the Harvest Street Fair that AWIP was handing out business cards advertising his blog. What a competitor! Walker was telling the She Rambler that he felt sorry for his Pastor. (Walker was referring to the cancellation of the mission trip to India.) The She Rambler immediately thought my 6 year old was talking about AWIP’s blog… I think that is giving AWIP a little too much of a glory bone to think a 6 year old would be following his blog. I do not know who A.W.I.P is,but if I were him, I would not mess with the “green milk” man. 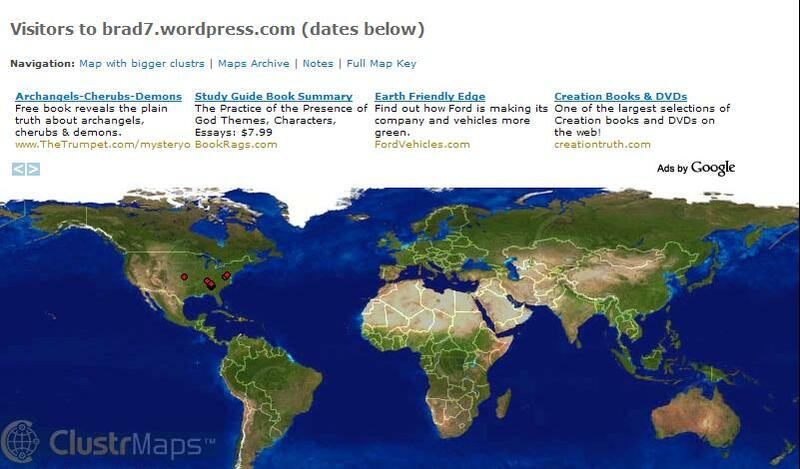 I am not sure the maps are accurate, I put one on mine and it does not have the same numbers as the wordpress numbers. oh how the FOKUHL giant has fallen. and he knows the mendacious statment in the above blog. who shall call him out? It depends on what your definition of “handing out business cards” is!